It's no fun when you're missing a tooth. You may not feel comfortable eating or speaking. You might even avoid smiling in public. Fortunately, dental implants can help. A Dental implant can replace a single tooth, several teeth, or all the teeth in your mouth. Best of all, they look and feel like natural teeth. It can be embarrassing to have spaces in your mouth where a tooth is missing. But you're not alone. Some people lose teeth due to injury, tooth decay, or periodontal disease (infection of the gums and bone surrounding teeth). Others may not have had all their teeth grow in. Whatever the reason, dental implants feel more natural than dentures and other dental restorations. If you want a dental restoration that looks and feels as though it's really part of your mouth, a dental implant may be right for you. 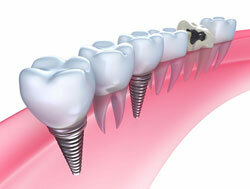 Dental implant surgery consists of an artificial tooth root. Your jawbone fuses with the implant to provide a secure platform for a prosthesis (artificial tooth). If you are missing many teeth, several implants can be used to support a partial or complete denture. Throughout the process you'll work closely with a dental team. Part of the team prepares your jaw and surgically places the implant. Others build and adjust the prosthesis. Your surgeon may be an oral surgeon, or a general dentist skilled in dental implant procedures. Your restorative dentist may be a prosthodontist or a general dentist. Take good care of your mouth during the implant process. Have dental checkups at least twice a year. Contact team members if you have any problems. To learn whether you're a good candidate for dental implants, you will have a dental evaluation. The evaluation includes a dental exam, a dental and medical history, and imaging tests. As part of the exam, the health and structure of your mouth are studied. This helps the dental team understand where to place the implants. The height and width of your jawbones are measured. This is done to make sure there is enough bone to hold an implant. Your gums are examined for signs of periodontal disease. Diseased gums need to be treated before implants can be placed. Your gums are also checked to see if there is enough firm tissue to surround an implant. The more your surgeon learns about you, the more successful your implant surgery is likely to be. Your dental and medical history is an important part of this learning process. It includes questions about your overall health and any previous dental treatments, such as crowns and bridges. You'll also discuss your expectations. Why do you want dental implants? What do you hope the results will be? Finally, you'll discuss factors that can affect healing after surgery. These include smoking and the use of certain medications. If you have an ongoing medical condition, such as diabetes, you may have blood tests. This is to make sure your condition is under control before treatment begins. Also, be sure to tell your surgeon if you take medications, such as insulin or a blood thinner, including aspirin. Imaging tests are a key part of the dental evaluation. They make it possible to view parts of the mouth and head that can't be seen during an exam. Imaging tests also help your surgeon lean more about the quantity and quality of the bone in your mouth. Dental x-rays show teeth and jaws. Panoramic x-rays provide a wide view of the jaws, tooth, nerves, and sinuses. They can also help indicate bone problems. Other imaging tests, such as a CT scan or x-ray tomography, may be used. After the evaluation, your surgeon and restorative dentist will each discuss treatment options with you. You'll also talk about any dental work or special procedures you may need before the implant process can begin. Having a healthy mouth is just as important for implants as it is for a natural tooth. If you don't have enough healthy bone or gum tissue in your mouth, you may need a graft before implants can be placed. Grafting helps build a solid foundation for the implants. You'll probably have to wait for a graft to heal before you can have implant surgery. If you have periodontal disease, it will also need to be treated prior to placing the implants. Graft surgery can build up bone or gum tissue in an area where it's lacking. It can also replace bone and gum tissue that has been lost due to disease or trauma. One type of graft surgery is the sinus lift (a procedure to build up bone at the bottom of the maxillary sinus). This adds height to the jawbone, ensuring enough bone to hold an implant. Bone for a graft may be taken from your jaw, hip, or other sources. Sometimes a synthetic (artificial) graft is used. A graft to build up gum tissue usually comes from your own mouth. Periodontal disease weakens gum tissue. Left untreated, it can also weaken bone and lead to the loss of both natural teeth and implants. Depending on your condition, cleanings, medications, or surgery may be needed to treat the problem. You'll also need to practice good oral hygiene throughout your life. This will help keep periodontal disease from returning. It will also help your implants last longer. If you're a good candidate for an implant, the dental team will talk with you about a treatment plan. You'll also discuss the costs and time that may be involved. Keep in mind, your commitment during the process will be crucial. In many cases it will take at least several months before new prosthetic teeth can be attached to implants. If you need a graft or treatment for periodontal disease, the process is likely to take longer. If dental implants aren't right for you now, consider your alternatives. One option may be a bridge to replace your missing tooth. If you already have a denture, adjusting it for a better fit may help. You can also decide to have implants at a later time. Together, you and your surgeon will decide what's best for you. A dental prosthesis is secured to one or more implants. It can be made of one or many artificial teeth. The prosthesis you have will depend on your dental needs. If you're replacing a complete set of teeth, you may be able to choose between a removable or fixed prosthesis. Depending on how many teeth you're missing, you may have a single, partial, or complete prosthesis. The more teeth to be replaced, the more implants you will need. For most people, a permanent prosthesis won't be made until the jawbone has fused to the implant. Until then, a temporary prosthesis may be used. A complete denture prosthesis replaces all the teeth in an upper or lower jaw, or both. The numbers of dental implants needed depends on whether a fixed or removable prosthesis is used. There are two types of complete denture prostheses: removable and fixed. Both can be used to replace a complete set of teeth. Removable means you’ll be able to take it out of your mouth. Fixed means it can only be taken out by a dentist. You and your restorative dentist can discuss which type is best for you. With a removable prosthesis, the new teeth are joined to the implants by a connecting device, such as a clip and bar. This allows you to take the prosthesis out for cleaning. For support, this type often uses four to six implants per jaw. With a fixed prosthesis, the new teeth are fitted to a frame that is secured to the implant. Five or more implants are placed along the contour of the jaw. In some cases, a fixed prosthesis offers more stability for chewing. For more information on dental implants in the Pasadena, CA area call Pasadena Dental Implants at (626) 796-1241!